This, I think, points to the problem with most definitions. Saying that a sentence begins with a capital letter, ends with a period and expresses a complete thought is the very least that we can say about a sentence. The very least. And our students know that. They know that this definition says next to nothing, and most of them wisely ignore it, or if they do force themselves to remember it for the quiz at the end of the week, they ditch it at the classroom door immediately afterward. Wise them. They know that this definition will never connect them to good writing, to the magic that lies at the heart (the middle) of crafting a beautiful sentence. Or even a functional sentence. Students know that if they really want to learn what writing is, then they have to learn it from the inside out, the way they learn video games. They learn Skyrim from the middle, and they have to write from the middle. The above definition separates them from writing. Who's interested in that? You also have to define from the middle, and maybe soon I can actually start doing that. I want to talk more about defining from the middle-out rather than from the out-in, as this change in vantage changes the relationship between the subject (the defining agent) and the object (the defined agent). And by the way, I want to shift to first-person singular case. I've been using the more inclusive second- and third-persons, but I want to speak only for myself for a bit. Through a fairly involved argument which I will not repeat here, Morin insists that as open systems both subject and object are constitutive of each other. "The world is interior to our mind, which is inside the world. … In the same way that as in microphysics, the observer disturbs the object, which disturbs the perception, in the same way the notions of object and subject are profoundly disturbed each by the other: each opens a crack in the other" (26). So is reality in the mind (the subject) or out there (the object)? Well, it's in the dynamic interplay between the two. It's in the connection. It isn't a case of either/or, it's a case of and/and. So as I define connectivism, connectivism defines me. Moreover, my observations about connectivism change it, which changes my observations (my self), which changes connectivism, and so on. There is always, then, an indeterminism and uncertainty which must be allowed for in my definition from the middle. This definition from the middle does introduce at least one problematic issue: I am in the middle. This can be construed to say that I am the center of connectivism, or indeed, of the entire Universe. Of course, I am in the middle of the Universe. If it is infinitely expansive one way and infinitesimally shrinking the other way, then I must be in the direct middle. How do I keep such a view from degenerating into an oppressive narcissism? Well, two correctives come to mind immediately. First, the Universe and I have a quite recursive and reflexive relationship, and it defines me as much as, if not more than, I define it. I am as defined as I am defining. Second, and perhaps more importantly, everyone else is at the direct center of the Universe. Moreover, their lives, activities, and knowledge become part of the Universe that I am in a reflexive relationship with, just as my life, activities, and knowledge are fed back; thus, I must account for their knowledge as an integral part of the Universe I'm trying to know. I may be at the center of the Universe, but the Universe does not revolve about me. I may be at the middle of connectivism, but it does not revolve about me. Rather, my knowledge of connectivism is fed back into the eco-system where it must work out its own salvation among all the other ideas, and those ideas feedback into me to change my ideas, and round and round, in and out, up and down, or in whatever motion I want to envision it. So what does it mean to move to the middle? It seems to mean more than just a shift in point of view, but it is that as well. Indeed, it is a recognition that there actually is a point of view. Definition from outside the system inward is the attempt at a null-view, an objective view. It seeks to efface the viewer, to remove the human from the vision. It is an impossibility. We always look from a point of view, in all the meanings of that phrase: physically, mentally, socially. There is no other way to look, and moving to the middle forces us to accept that. When we move to the middle of a system such as Connectivism in order to define it, then we start with the DNA of the system PLUS whatever DNA we bring. For instance, as I am working out the definition of Connectivism, I contribute my understanding of Deleuze and Guattari's rhizome, as does Dave Cormier. I don't know that everyone is happy about this rhizomatic influence, but it is really impossible for me (I won't speak for Dave) to snip away the bits of DNA that I have absorbed from Deleuze and Guattari. I also bring my thoughts about Morin and complexity and my thirty years of teaching English composition. I probably also bring in bits of nucleic acid from the 60s and my life as a father and husband. My very presence in the middle of Connectivism rearranges the space. You can say this pollutes the space, the purity of the idea, but I don't know what that gains you. It's simply impossible for me to be in here without tracking some of my DNA about. Likewise, you can't be in here without making your contribution, and as I work to define Connectivism, I have to account for your DNA as well as mine and all the others. Now, I've mixed metaphors (point of view and DNA), but I'm comfortable with it. They both work for me. But what about the point of view from the middle? Well, the boundaries look very different from inside. For one thing, they are not nearly so distinct as they are from the God point of view, which can delineate quite nicely the boundaries of Cognitivism, Behaviorism, Constructivism, and Connectivism. The God view can then apportion what belongs to each: Oh, talking about human agency? That belongs to Cognitivism, not Connectivism. You network guys can't talk about that. From the middle, I can look out at anything, and the question becomes not what issues belong to which system but what can I see differently from this system than from the other systems. Connectivism can look at human agency and quite likely say some things about it that are not so easily said from the other systems. I like to think of it visually. Imagine four vantage points in a wilderness (pick your flavor: desert, forest, or tundra), and label them Behaviorism, Cognitivism, Constructivism, and Connectivism. Each vantage point brings certain ad-vantages, showing us things about the wilderness that we could not see or not see so well from the other vantage points. Each vantage point has its distinct uses. None of them give the complete picture. Each of them can give us a better idea of how to get where we are going, depending totally on where we are going. I must apologize here for the slight trick I just played. In visualizing the four vantage points, I gave you a God view, a point of view you could not in reality have unless you were in an airplane or you were … well, God. Still, the fact that you could imagine such a point of view shows that this point of view has its uses. However, this point of view is always secondary to the anchored points of view. I pick up this insight from a wonderful statement by Bruce B. Janz in his essay The Territory Is Not the Map: Place, Deleuze, Guattari, and African Philosophy where he says that place precedes space. Well, what he precisely says is: "I want to argue that place, the place we find ourselves in and which has meaning to us, precedes space, the bounded and abstractly defined territory." Isn't that clever? I'm glad I came across it, as it clarifies things for me. What it says to me is that space builds upon place. I must have a sense of place before I can develop a sense of space. Place comes first. From a sense of concrete place, I can eventually develop a sense of space, but not the other way around. From my sense of Macon, Georgia, USA (where I have lived the longest), I can develop a sense of the large space that encloses that place, but it seems to me, I am always working from the inside out: from place to space. I am always standing in one place looking out to the cosmos. I can imagine looking at the Universe as God might, but it really is only a fictional point of view always grounded in my sense of place. Let's look next at the characteristics of Connectivism that Siemens listed, working from the inside out. Could be fun. I said earlier that a definition is about the least that we can say about anything—teacups, for instance. This does not mean that we shouldn't say the least that we can say. What it means is that this is the barest of starting points. This is the point at which we begin picking ourselves up by our bootstraps to create meaning out of almost nothing. This is the DNA—the arrangement of "discrete units, empty of meaning (like phonemes or letters of the alphabet), combining into complex units, carriers of meaning (like words)" (On Complexity, 13). As Morin says of information: "Information is not an end-of-the-line concept, but rather, a point-of-departure concept" (14). As he says later, we must learn to define from the center out, not from the outside in. Learning and knowledge require diversity of opinions to present the whole … and to permit selection of best approach. Learning is a network formation process of connecting specialized nodes or information sources. Knowledge may reside in non-human appliances and learning is enabled/facilitated by technology. Learning and knowing are constant, on going processes (not end states or products). Ability to see connections and recognize patterns and make sense between fields, ideas, and concepts is the core skill for individuals today. Decision-making is learning. Choosing what to learn and the meaning of incoming information is seen through the lens of a shifting reality. While there is a right answer now, it may be wrong tomorrow due to alterations in the information climate affecting the decision. These, then, are the starting points for defining both connectivism and rhizomatics. These are the bits of DNA out of which we can create meaning in a particular kind of way. If this is where we are hoping to end up, then we've missed it, I think. We can, of course, use these definitions to isolate both concepts, distinguishing and separating them from their competitors (if we choose to see it as a competition), and in the end we will pull them both from the eco-systems that feed and inform both and that they both feed back into. In the end, we will kill both concepts. To keep both concepts alive, we most start at these points, and possibly a few other points, and then work outward from the center. To my mind, then, this is the first step in changing the way we define: locate ourselves in the center and work outward from there—recognizing, of course, that we have become part of the definition. We cannot overlook that. Definition from the inside-out means that we are part of the definition. We have no god-like privilege or position outside the system we are defining. Trying to take such a position is a fiction, a not always helpful fiction. I said yesterday that a definition is about the least you can say about something. My wife and I had friends over today, and the talk turned to teacups and my wife's impressive collection. The Net defines a teacup as: a cup from which tea is drunk. I don't know about you, but I can hardly imagine saying less about a teacup, but I can imagine saying more. I recall when, as a newly married couple, Daphne and I were first visiting my parents' home. Wanting to impress her new daughter-in-law, my mother served hot tea for breakfast instead of the usual coffe. Daphne's face went ashen as Mom passed her a coffee mug full of Luzianne tea. The breach of that moment has been bridged, but not forgotten. Of course, you only serve tea in fine china teacups, and you should use only Yellow Label Lipton or Red Rose teas for breakfast. When my family arrived in Nassau for the summer break from teaching, we were always greeted with a cup of tea. We would unload the bags in our bedrooms, and by the time we had returned to the family room, the tea was on, usually accompanied by a slice of Ma Gwennie's pound cake, a rich, buttery bit of yellow heaven that melted on the tongue and in the heart. All the family would usually pop in to greet us, and before the pot was finished more water was brewing. My boys learned to love their Nassau family over a cup of tea. 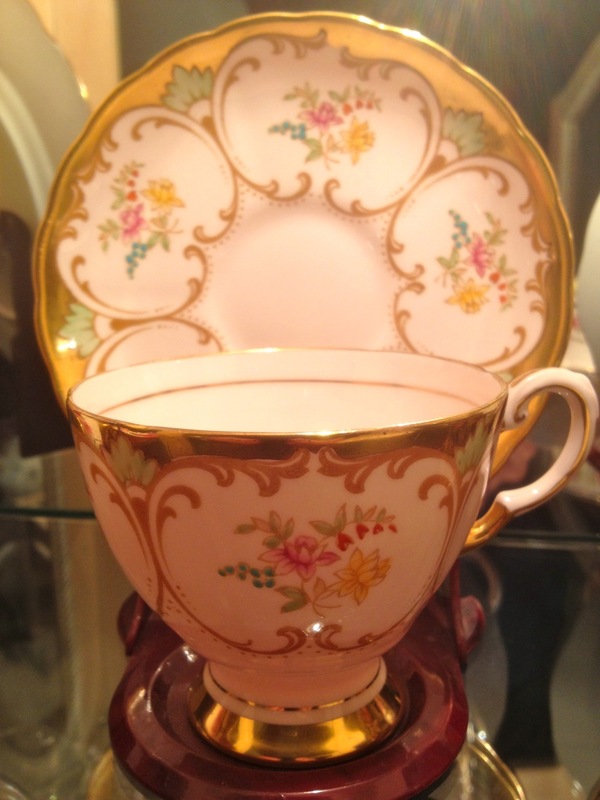 An auntie gave us a particularly beautiful Tuscan teacup not long before she was diagnosed with breast cancer. A sister-in-law gave us several teacups from the collection of her grandmother who had passed away in Idaho at the age of 100. A dear friend returned from a cruise of the Rhine River with a teacup. My father returned from the Ukraine with a set of teacups. My dear mother-in-law left her entire Shelley collection to my wife in her will. Those teacups are precious. Just this afternoon, I served tea to my wife, sister-in-law, and a couple of cousins from the Bahamas. Honestly, the teacups were not the center of conversation, but they were witnesses. So much of the life of my family has flowed through teacups. And this doesn't even begin to cover all the things that a maker of fine porcelain could tell you about clay, calcined bone ash, molds, casting, firing, and glazing. You could spend years becoming a master craftsman, and quite likely, even if you were gifted as well with words, you could not define teacup as you really know it. A dictionary definition, then, is an example of what Edgar Morin calls simple thought. Such thought is convenient and handy, and sometimes it is sufficient for the need, as Dave Cormier explains in his post about the Cynefin framework of Dave Snowden. But simple, dictionary definitions are not sufficient for complex, open systems such as Connectivism and Rhizomatics. This, I think, is why Cormier and Siemens do not want to define either concept. Still, people want to know what they are talking about when they say Connectivism or Rhizomatics, and they are reasonable to ask for definitions. How, then, does one define without reducing to an almost meaningless statement? I like this question. This past Thursday night, I checked in on the CCK12 online session about one of my favorite topics: complexity. When George Siemens opened the session for questions, I raised my hand to ask him if he has had to change the way he defines Connectivism, given that it is itself a complex, open system for studying complex, open systems. As too often happens in an open forum, I did not frame the question well, and George seemed to think I was asking for a definition of Connectivism. That wasn't my intention, so let me reframe the question here. I think it's important. What I want to get to is the problem of defining complex, open systems. This issue has been popping up from time-to-time from lots of different people and in different contexts. It seemed especially contentious in Dave Cormier's recent discussion of rhizomatics. Lots of people pressed Dave to define rhizomatic thinking, and he did an admirable job. People also press Siemens and Downes to define Connectivism, and in Thursday's session, George noted that he has made a number of statements about what Connectivism is throughout his writing, but that basically he doesn't like to define it too precisely. That isn't a bad tack: just don't define it. Let the concept work itself out, or not. Perhaps that's the tack we should take with rhizomatics, but I agree with Deleuze and Guattari that if we don't say something, then we will not be convincing. But how do we define Connectivism or Rhizomatics? I think the problem begins with the act of definition itself. In brief, it seems to me that our habits of definition are informed by the reductionism that has characterized Western intellectual life for the past 300 years. I think we need a new way of defining, a new procedure. I'm certain that someone has dealt adequately with this issue already, but I'm not aware of who has done it or what they have said. If someone will send me a reference, I will be most appreciative. to determine or identify the essential qualities or meaning of. a : to fix or mark the limits of : demarcate; b : to make distinct, clear, or detailed especially in outline. Defining in this sense is an intellectual activity from the outside in. It is an act of overcoding and power by an outside subject onto an object. The outside agent first defines the essential characteristics of the object and then marks the limits or boundaries of the object. Thus, it is an act of reducing the object to its barest minimum. I believe that a definition is always the very least that you can say about anything, which in most conversations renders it useless. There is nothing more to say about the dictionary definition of innuendo, but I'm still learning about Wallace Stevens' definition. The dictionary definition creates a closed entity with clear, fixed boundaries, an inert nugget, the ideal item for a multiple-choice question on a middle school English quiz. The Stevens' definition creates an open entity with permeable, active boundaries, a rhizome. It is anything but a multiple-choice answer. We very well may write about Stevens' meaning for the next few centuries. Connectivism needs this second kind of definition. I think Morin has something useful to say here, and I'll take that up next in a next post. G'night. PS: I just looked at Dave Cormier's latest post, and I see that he is tackling the same issue as I. What happy serendipity. Dave starts with Snowden's Cynefin framework, a concept that I intended to tackle in a later post, but now Dave has done most of the thinking for me, and he's spot on, so I'll just rip, mix, and burn. Further, I sense that he, too, is unhappy with the process of defining Rhizomatic learning, at least in the terms that most people seem to demand. Nice. Sometimes you follow a line of thought like a crack in the ice, excited to see where it goes but also wondering if all break-throughs are such a good thing. Anyway, in my last post I tackled the issue Frances Bell posited about "the connections between humans and non-human in understanding learning," and I suggested that Morin's concepts of open and closed systems might contribute in some way. An open system, by Morin's definition, exchanges energy, matter, organization, and information with its eco-system, which includes both closed and open systems. This exchange makes for a stabilized dynamism that is self-organizing and in some fashion aware of its environment. By awareness, I mean that the open system—an amoeba or a sunflower or human—can perceive changes and options in its environment and make choices that help it respond to those changes. For instance, an amoeba can perceive a drop of acid in its petri dish and can turn away. It seems to me that most open, living systems have relatively few perceptions and choices, but as we move toward more complex systems, we can see an increase in the relative number and variety of perceptions, choices, and responses, but this might be an entirely chauvinistic bias on my part. Amoeba may live in a world as rich with potential as mine is. I don't know. Anyway, we humans commonly believe that the dynamic relationships between the open, living system and its eco-system become more complicated and more nuanced, more distanced from a simple stimulus-response, though never losing that simple basis for interaction. In other words, stimulus-response always remains necessary for explaining the behavior of living systems, but it seems to become less sufficient an explanation as we move toward the human. The open system, then, participates in defining itself in and through its interactions with its eco-system, and it participates in graduated degrees from the most simple life form to the most complex, us humans. Again, my chauvinism is showing. The open system starts, of course, with a given configuration of energy, matter, organization, and information from its genetic parents, but it can modify that basic configuration as it interacts with its eco-system. The task for the open, living system is to constantly monitor its environment and to open itself to good things in the environment and close itself to bad things. Open systems have evolved different mechanisms for opening and closing themselves to manage the flow of energy, matter, organization, and information between themselves and their environments—in other words, to manage their connections—but they all seem to have some mechanism. We humans appear to have quite sophisticated mechanisms, including the ability to develop new mechanisms. This constant opening, closing, and reopening of the self effectively makes the boundaries between the individual open system and its environment dynamic, malleable, and porous, and it effectively changes the way we should define the individual. Traditionally, we have defined open, living systems from their skin, hide, cell wall inward. Now, as Morin shrewdly observes, we must define living systems from their center outward, knowing that the skin, hide, or cell wall is porous and that the boundary between the individual and her eco-system is open to negotiation, growth, and dynamic shift. This negotiation, this interplay between the individual and its environment, introduces the concepts of intentionality and power for me. When an amoeba swims forward into a drop of acid, it has a choice to make: continue forward into a bad environment or swim away into something better. Its decision to move away forms the rudiments of intentionality and power. While the amoeba's decision may be much closer to an automatic stimulus-response kind of decision than to the complicated moral choices that humans make, it is the bedrock of intentionality and power, the sort of bedrock that a stone, for instance, does not have. As far as we know, a stone has no choices. This allows me to distinguish between force and power. A stone has force, but no power, at least not as I am using the terms. If moving, a stone can strike another thing with force, and if the stone is bigger and harder and, thus, carries more force, then it demolishes the smaller thing, or if the other thing is bigger and harder and, thus, carries more force, then the stone is demolished. As open, living systems, we humans have force, but we also have power. If I encounter you, then I exert a gravitational force on you that does not depend on my intention, but if I hit you or hug you, then I have exerted a power on you that is dependent on intentionality. Force is independent of power; whereas, power emerges from force. Because power is an emergent property of open, living systems, force is not sufficient to explain power, though understanding force can clarify power. Power functions at a more complex level than force, and as such, it has rules and capabilities and implications that force does not. I'll worry later about the differences between force and power, but I want to shift now to talking about humans, non-human appliances, learning, and how they all connect before I get any further out on this very thin ice. It seems to me that much of what we humans do as open, living systems is learn about our environments: we learn what good things to connect with and bad things to avoid. Infants start learning early what to put into their mouths, what not; what to stick their fingers into, what not; when to sleep, when not; when to cry, when not. They learn to distinguish good energies and matters from bad and to choose appropriately, but infants also start learning very early about organizational and informational exchanges and how to distinguish the good from the bad. They learn family and not-family, group and not-group. They learn truth and lie, how to get to school and how not. The various connections or flows that humans cultivate or deny begin to redefine who they are. The physical, genetic substrate for any individual remains, of course, but it is not sufficient to sustain the individual, or to define them. The sustenance and definition of an individual depends as much on the interactions with the individual's eco-system as it does on the core genetic material that the individual starts with. Perhaps sustenance and definition depend more on our connections. At any rate, our connections are indispensable, and we cannot understand ourselves without understanding those connections. Our meaning emerges in our dynamic connections, and these connections seems to inevitably involve matters of intentionality, power, and learning. When closed systems interact, we can describe the interactions as forces and regularities, but when open systems interact, even with closed systems, then we must add power and intentionality to the description, especially if we are looking at the interaction of two or multiple open systems—a student and a teacher, for instance, or a shopper and a recommendation engine. I like that. An individual is a moving precipitate, a nexus for the dynamic connections it attracts, carries, sustains, and abandons on its nomadic way. Well, I let this sit overnight for a fresh look, and I don't think the crack in the ice took me where I thought it would, but I'm okay with that. I'll let this stand. I wanted to think about an issue I hadn't really thought about before: the connections between humans and their non-human appliances, and I did a bit of thinking. Did I reach a conclusion? Nothing that I'm willing to bet on, but I did lay some groundwork to continue thinking. I think relationships between humans and smart machines cannot be explained simply in terms of amoral force. The machines themselves are coming to simulate open systems so well that we must begin to relate to them as open systems. This necessarily involves intentionality and power, and Connectivism which focuses on connections must recognize this intentionality and power and offer an explanation for it, or at least an examination of it.